Traditional wine-making in steel casks; 10-15 day maceration at controlled temperature. 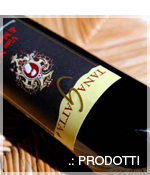 After fermentation, the wine is aged in Slavonian oak casks for 3-4 months. After bottling, the wine is kept in the bottle for at least 2 months before being marketed. This extremely versatile wine is particularly appreciated for daily drinking. Delicate and delicious flavour. This “crisp” wine is ideal for matching pasta dishes with tomato and meat sauce, meat, and cheese.